Now that NVIDIA's new mobile GeForce RTX 20-series GPUs are available, laptop manufacturers have wasted no time in giving their notebooks a shot of some ray tracing goodness. 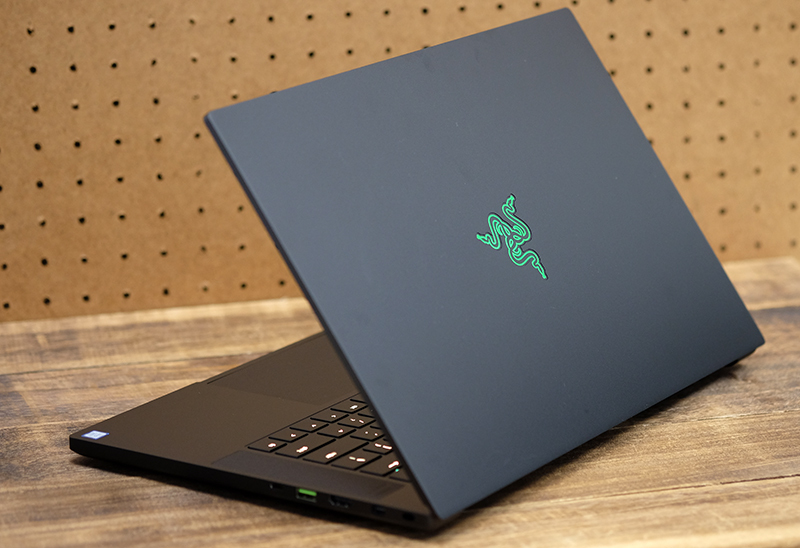 The new Razer Blade 15 Advanced may look the same as last year's model, but it's really quite a different beast altogether. 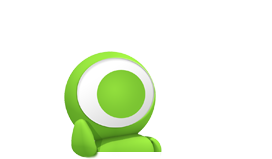 The above configuration will cost you a good S$4,679, but that's the price you pay for the most powerful mobile graphics engine on the planet. Having said that, it looks like performance can vary quite a bit between different Max-Q notebooks, and thermal design matters a lot, so it'll be interesting to see how the Razer Blade 15 does in this aspect. Other than the vastly more powerful GeForce RTX 2080 Max-Q, Razer has made a couple of small changes under the hood. The webcam is now paired with a Windows Hello infrared camera, so you can log in quickly using facial recognition. 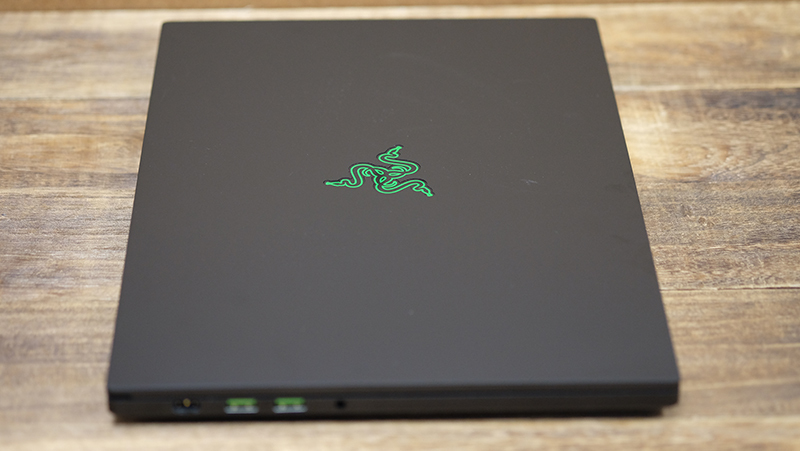 Razer first introduced this feature on its new Blade Stealth ultrabook, and the Blade 15 is merely following in its footsteps. Either way, it's a nice inclusion that helps make the Blade 15 more competitive in a stacked field. The webcam has just a 720p resolution though, which delivers passable, but not great, video quality. The Blade 15 is also a hair thicker than its predecessor, measuring just 17.8mm to the latter's 17.3mm. Still, that's a negligible increase compared to the performance boost you're getting. The wireless card has also changed from an Intel Wireless-AC 9260 to the Wireless-AC 9560, but this difference is pretty inconsequential. 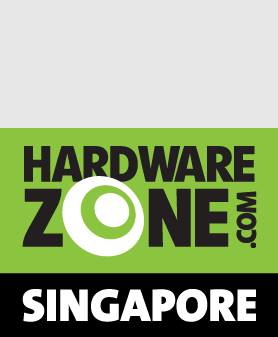 Both of them are dual-band 2x2 modules that support speeds of up to 1.73Gbps, and the only difference is that the 9560 is also available in the smaller M.2 1216 form factor. In my view, the Blade 15 remains one of the most attractive Max-Q gaming notebooks on the market. Its build quality is second to none, and the unibody aluminum chassis is solid in a way few other gaming notebooks are. The display covers 100 per cent of the sRGB color space, and colors appear bright and vivid. The panel has supposedly already been calibrated at the factory, and it shows here. 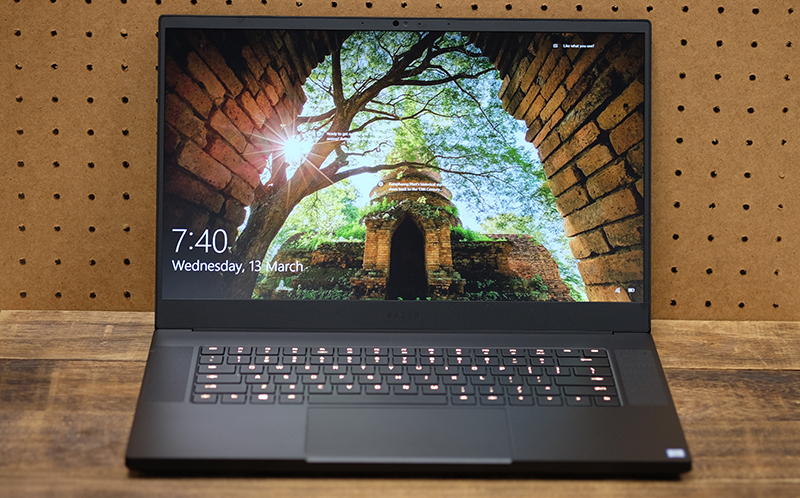 Furthermore, with most gaming laptops, I always feel like the screen could use a boost in brightness, but this is less of a problem with the Razer Blade 15. The screen also has a matte coating to help with reflections, and it works really well. The 144Hz display makes a return here as well, and I think it really should be standard on all gaming notebooks. The high refresh rate makes gameplay (and even dragging around windows on your desktop) feel far more fluid and responsive, and it's one of the biggest changes you can make to improve your gaming experience. 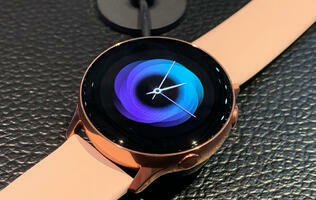 The display is framed by super thin 4.9mm bezels that help create a more immersive experience. More importantly though, there's still space at the top for the webcam and Windows Hello infrared camera, so nobody has to look up your nostrils. The slim bezels also reduce the space footprint of the laptop, so you get a 15.6-inch screen in a chassis that's closer to the size of a 14-inch model. Then there's the excellent glass precision trackpad. 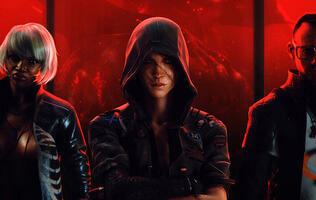 Quite frankly, it's great. 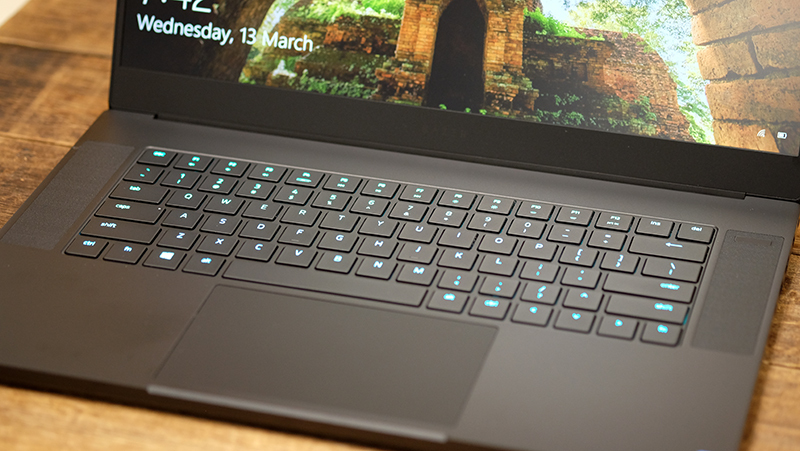 I know that the trackpad isn't the most important thing on a gaming notebook, especially when you're going to be using a mouse with it most of the time, but Razer's attention to detail here still adds to the overall user experience. This bodes well if you intend to tote this notebook around for work, which suits it well given the fairly muted outlook. The buttons are integrated into the trackpad, so it looks really sleek, and its generous size gives you plenty to work with. In comparison, the trackpads on many gaming laptops are much smaller and feel far more cramped. The keyboard itself supports per-key RGB backlighting, so you'll have plenty of customization options within the Synapse 3 software. 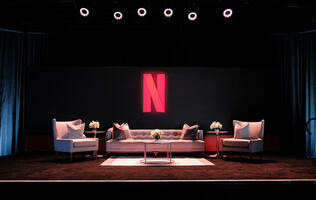 Overall, the notebook feels quite thoughtfully designed. Port placement is good, and the sides aren't interrupted by any vents spewing out hot air at your hand. The Blade 15 also has a single Thunderbolt 3 port on the right, a feature that for some reason still isn't found on many gaming laptops. 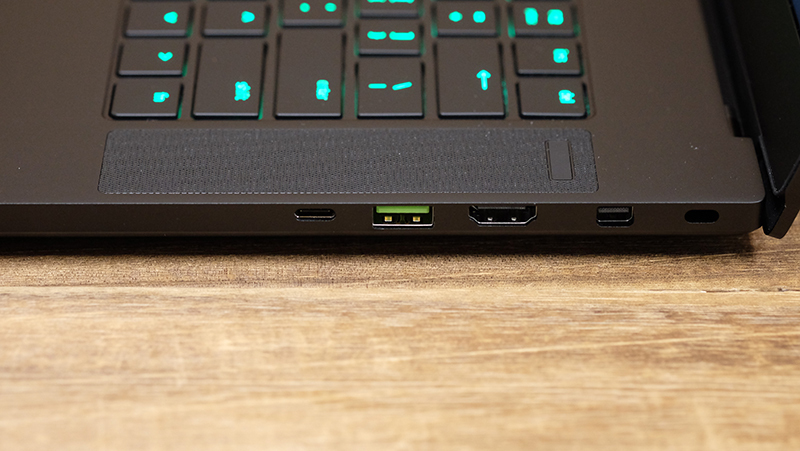 Arguably, gaming laptops need a Thunderbolt 3 port more than an ultrabook, as you're more likely to want to hook it up to an external graphics dock for additional graphics horsepower. The Blade 15 also has three USB 3.1 (Gen 1) ports, one mini DisplayPort 1.4, and a full-sized HDMI 2.0b output. The laptop uses a proprietary power connector located at the rear of the notebook's left profile. The placement of the connector may seem like a minor detail, but I've encountered a number of laptops where the power connector is located awkwardly in the middle, sandwiched between vents and USB ports. 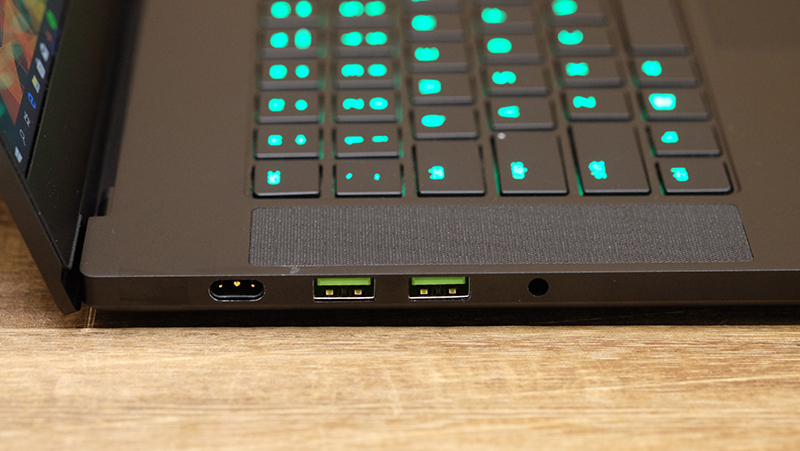 Razer's design lets you easily route the power cable to the back of the laptop, which is quite helpful. On top of that, the sides of the notebook don't feature any vents, so you won't have to put up with hot air that gets dumped onto your mousing hand. The absence of side vents is also a pretty good decision aesthetically speaking, since it makes for a cleaner look and adds to the impression that the laptop is a solid block of metal. 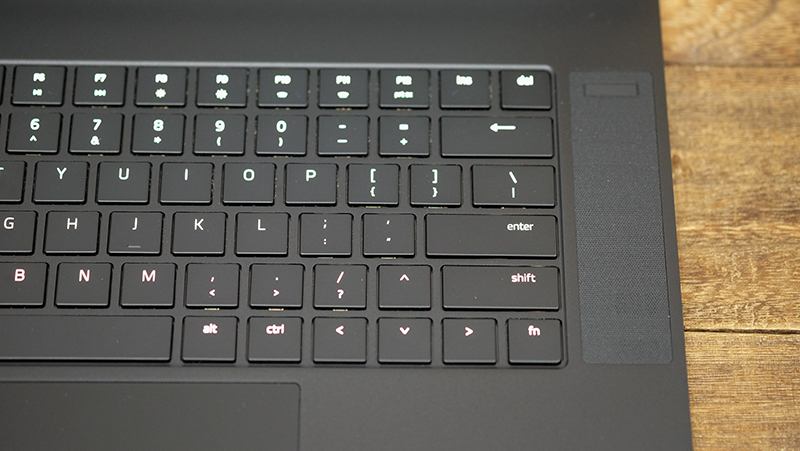 My main complaint about the Blade 15 would be the non-standard location of the right Shift key. Instead of sitting next to the question mark, it lets the top arrow key come between it and the latter. In other words, if you're in the habit of using the question mark in tandem with the right Shift key, you may find this layout pretty grating. The laptop also gets super noisy when it's working hard, so you definitely need to put on headphones to block out the whir of the fans. You can customize the fan speed in Synapse 3, and the noise problem is made worse by the fact that you'll probably want to set the fans to maximum to squeeze every drop of performance from the laptop and reduce heat. That said, I have yet to encounter a Max-Q notebook that actually managed to get a handle on noise output, so the Blade 15 is no worse than the competition in this respect.